The Danse Macabre of this fiscal crisis has been inflicted upon America from the left footed bunch led by Obama and Majority Leader Reid. Their leadership has placed America in dire circumstances. Democrats have spent more money than the federal government collects in taxes and Fees. The Senate has not passed a budget in 822 days. Obama's 2011 budget delivered to the Senate was an astonishing 3.2 million dollars. It was so outrageous the Senate defeated it 97-0. Republicans have proven, not just once, they can lead. They led with Cut Cap and Balance, but democrats preferred to sit at the table. Republicans offered a second bill Friday, once again leading with legislation which made concessions to the sensitivities of Democrats, and still the Democrats answer was, "I won't dance don't ask me." 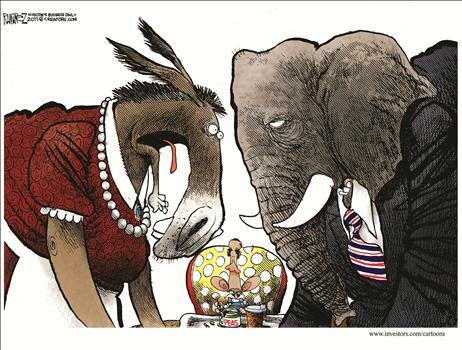 Democrats decided to sit at the table. Republicans are dancing as fast as they can all alone. Republicans cannot find a partner with either the President or the Majority leader in the Senate. Left footed politicians in the Democrat party refuse to accept thier invitation to the ball, and either they do not like the steps or their shoes are to tight, or too expensive. The Democrats wild gyrations are not the Quick step of economic sanity that the judges of this dance, credit rating agencies, Bond markets and our lenders have tuned in to see. America is witnessing a Dance Macabre. The Debt Ceiling Impasse caused by Democrats and their two left feet (Senator Reid and President Obama). After watching hours of Democrats hustle, twist and waltz alone on the Senate floor my head was spinning. America was subjected to one after another repitive factually inaccurate speech, filled with threats, given during a blame throwing tribal dance. Democrats have decided, "They won't dance don't ask them". The Senate Majority Leader unbelievably filibustered his own bill that just last night (Friday) had been placed on the floor. After the filibuster ended (once again filled with rhetoric) by United States Senators insulting and calling American Voters on the right names, suggesting that honest working Americans are terrible terrorist. Democrats used Seniors and Military and Veterans as strawmen threatening they would not get paid. The Senate Majority leader could not coerce his left footed bunch nor force enough votes from his own caucus to pass the his own bill with 60 votes. (Democrats have 53 Senators). Then Majority Leader Reid in the middle of the Danse Macabre going on in the well of the Senate took a powder to the Whitehouse to talk to his other left footed partner President Obama, and took Pelosi who can't dance either with him. When the Majority Leader returned to the Senate after all the bashing and threats to American citizens had ended and time for the debate had expired. The Majority Leader of the Senate could not pass his own 2.5 trillion dollar bill that forces tax payers to dance as fast as they can to February of 2013, and allows left footed President Obama to waltz across America during the 2012 Campaign season. Majority Leader Reid decided that one day of dancing and threats was not enough. He delayed the vote on his bill first until 1a.m. Sunday then later decided to repeat the Danse Macabre at noon on Sunday. Never mind that left footed Obama is dancing to a funeral dirge. And it was Debt Ceiling Debate Day all over again. Democrats it is time to dance with the Partners American voters sent you. Senator Reid now is the time to be America's Majority Leader, and do what is best for America. President Obama, Suit Up and put your dancing shoes on. America is tired of lying Drama Queens giving speeches filled with untrue rhetoric given by two left feet who won't dance. We are not Zimbabwe, or Venezuela or some other third world scum pond with an uniformed citizenry. If our elected leaders cannot serve their bosses, (the people) then We The People will change them at the next opportunity for elected officials who will adhere to their Constitutionally sworn fiduciary duties. No More Agendas, no more insults to The People who sent you to the Dance. It is well past time for President Obama to soundly chastise Democrats and the mainstream media for calling average everyday American citizens vile names. It is time for the Democrats to for once put their agenda down and put America first. It is time for the Democrats to follow the lead of fiscal sanity. Republicans have put their right foot forward.